When last we left the Fizz, they were, well, not the Fizz, actually. After releasing two albums under the curious name Flood in the Fizzy Factory, the Burlington-based quartet trimmed their moniker to a slightly less unwieldy one. Led by songwriter/realtor Dave Kleh, the group trades in an off-kilter, decidedly lo-fi brand of New Wave-inspired electro-rock. Their latest release, Oh Mama, Hope You Know, continues the, ahem, Devo-lution started on their lackluster 2008 debut, Flood in the Fizzy Factory, and revisited on their improved 2010 effort, A Song for the Troops. Much as the band’s first two releases dredged the shallows of the vast New Wave waters charted by the likes of Talking Heads’ David Byrne and Devo’s Mark Mothersbaugh, Oh Mama similarly reveals Kleh’s affinity for skewed surrealism. However, the tandem lead cuts, “Think of You (Prelude)” and “Think of You,” suggest Kleh holds equal reverence for the darker, more muscular rock musings of Mark Knopfler. That’s not to say Kleh remotely approaches the Dire Straits guitarist’s otherworldly instrumental prowess — few do. But he’s clearly drawn inspiration here. “Love Is a Grand Piano” more closely resembles the frantic aesthetic of the group’s earlier efforts. Just as the album’s cover art is comically crude, Kleh’s emotionally stunted lyrics are strangely compelling — though whether creepily or endearingly so is open for debate. “Love is a grand piano, love is an interstate,” he sings with a slight, nebbish Brit twang. Then, “Love is an El Camino, love is a roller skate.” What does it mean? Does it matter? Do you dare find out? More than on their first two offerings, Kleh’s band frames the songwriter’s cracked tirades with something approximating compositional polish. To be sure, these are still rudimentarily arranged and raggedly performed tunes. But especially on cuts such as “Ladies Man” and “Life During Peacetime” — the latter featuring local guitar god Bill Mullins — the Fizz are tight and focused. For every honed track like those, however, others are bewilderingly strange. For example, the title cut. Over a haphazard hodgepodge of tinny synth sounds, Kleh babbles about bank bailouts, 9/11 and, um, Lord of the Rings. It’s meant as absurdist social commentary, the likes of which made Devo revolutionary. But the Fizz lack the nuanced substance to balance their surrealism — which is why Devo’s formula worked. Instead, Kleh favors nonsensical non sequiturs. Absurdity for absurdity’s sake has its place. But what made bands such as Devo and Talking Heads great was how they used surrealism to illustrate and skewer the absurdities of society. The Fizz, while compelling at moments and perhaps capable of similarly artful feats, could stand to take those lessons to heart. 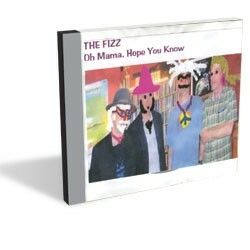 The Fizz celebrate the release of Oh Mama, Hope You Know at Radio Bean on Saturday, February 5.